After redoing the kitchen in our first house, we were hoping that our new house would have an old kitchen. Then, we could just gut it and start fresh. Plus, an old kitchen would save us some money on the asking price. However, that was not the case with the house we bought. The house itself was amazing, but the kitchen had somewhat modern granite countertops with old, dated cabinets. I spent so much time in the kitchen, from trying to get my one-year old to eat to upholding my title as family baker, and this kitchen begged for an aesthetic update. Currently, it had brown countertops, black appliances, oak cabinets with gold pulls, and there was red stone backsplash just behind the oven. 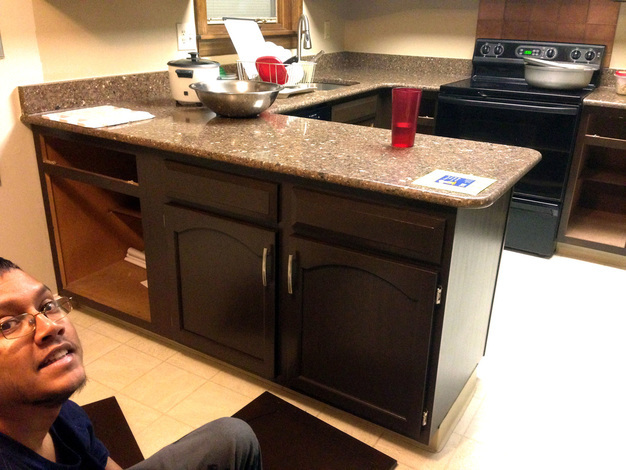 Even though brown granite would not have been our first choice, we didn’t want to gut the kitchen and waste the stone. My thinking was to come up with a plan that worked around the granite. I made some subtle changes first – I painted the walls a lighter color, which was the same color I had painted the open family room.This gave the downstairs a seamless feel and the lighter kitchen worked with the brown granite more than the tan did. Ash also replaced the ’70s vinyl baseboard with freshly painted white wooden baseboard. We had also planned to switch out our old black appliances with stainless steel ones. The oven and fridge didn’t keep their temperatures properly – Ash was constantly microwaving his ice cream because it was too frozen and my cookies were constantly burning even though the middles were cooked through. We had been waiting for Black Friday to get the best deals, and we did pretty well! Next, I had to make a decision about the cabinets. I wanted to gel stain them like I did with the bathroom vanity, yet I was nervous about it. 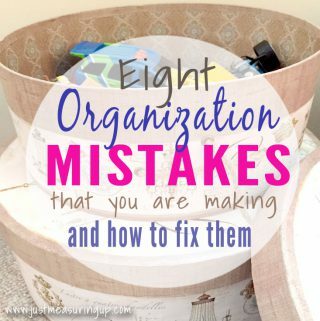 It was a huge undertaking! When I did the bathroom vanity, it was one cabinet. I came up with some other options, like staining just the frames and then replacing all the doors and drawer fronts; however, even those costs added up, and there was no guarantee that the colors would match. I hemmed and hawed over it, until I saw the forecast for the upcoming weekend. It was mid-November and the forecasters were calling for the 50s on Saturday and Sunday! Mild weather meant I could easily air out the kitchen from the gel stain. I decided it was now, or let the kitchen continue to drive me crazy until Spring. I used the same General Finishes Antique Walnut Gel Stain that I used for the bathroom vanity. ​I did three coats total (plus a little touching up here and there); in hindsight, I wished I had done four. My primary focus was getting the cabinet frames finished and the kitchen properly aired out. My secondary focus was the doors and drawer fronts because I could do those in the garage in batches. 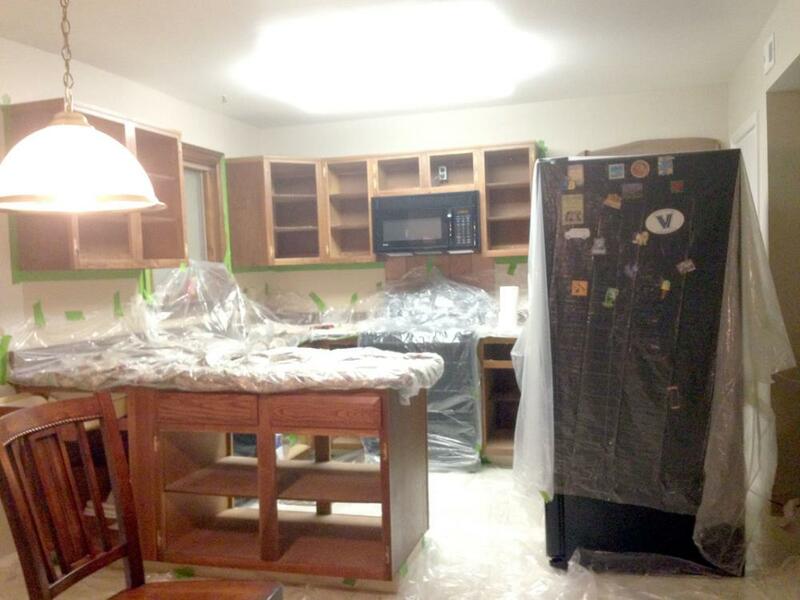 Prior to starting, we emptied the cabinets completely, and then covered the countertops very thoroughly, placing old bedsheets on the counters and then wrapping it all in plastic. We covered the appliances and the floor with plastic too. After two coats of stain, the cabinet frames were looking good! ​As you can see, we ventilated the room really well, strategically placing the fans so the fumes could exhaust efficiently. After three coats of stain, the cabinet frames were looking awesome! The dark brown was a big improvement. I should also mention this was the point in the project where I wasn’t sure if I liked it. Rest assured, once the cabinet doors and drawers were back, the new appliances came, and the backsplash was installed, I knew all the hard work paid off. Sidenote: On the left of the above photo, you can see the difference in the kitchen wall paint colors since I didn’t bother to paint above the countertops due to the upcoming backsplash. Therefore, you can see the old tan compared to the light ivory. The lighter color made the room appear bigger and was less matchy-matchy with the countertops. Sometimes when you try to match too much, the end result isn’t the best. After I was finished staining the kitchen cabinet frames, the instructions called for 5 days of dry time before the polyurethane. During this time, I started on the doors and drawers out in the garage. The weather was still pretty mild, which was great for drying. ​I worked on the doors and drawers in batches of six – which took me about 45 min per session. As soon as I got the last coat of stain completely on one batch, I moved onto the next batch. This way while one batch was amidst its drying cycle, I was able to keep the project moving forward. The below structure is something Ash made so that I could stain both sides of the doors during the same session. 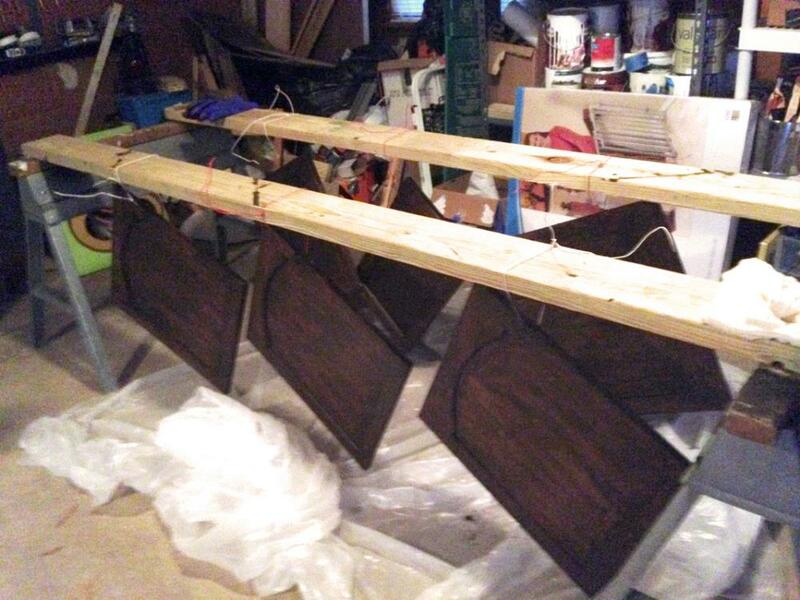 He used two sawhorses and two 2 x 6s to make this makeshift staining station, threading wire through the hinge holes to let them hang dry. I did most of the staining with the doors flipped up on the wood, and then I got to the hard-to-reach places while it was hanging. Here’s Ash putting the doors back on with their new hardware and hinges. He doesn’t look too thrilled, but trust me, he was! ​We were over the moon to have a functional kitchen again. Coincidentally, I decided to stop eating gluten around the time we undertook this project – so instead of ordering pizza night after night (which we definitely would have done otherwise), we saved a bunch of money chomping on fruits, veggies, and frozen meals that we made ahead of time. As far as cost, we spent about $150 on the gel stain and polyurethane and about another $20 on foam brushes and chemical-resistant gloves. 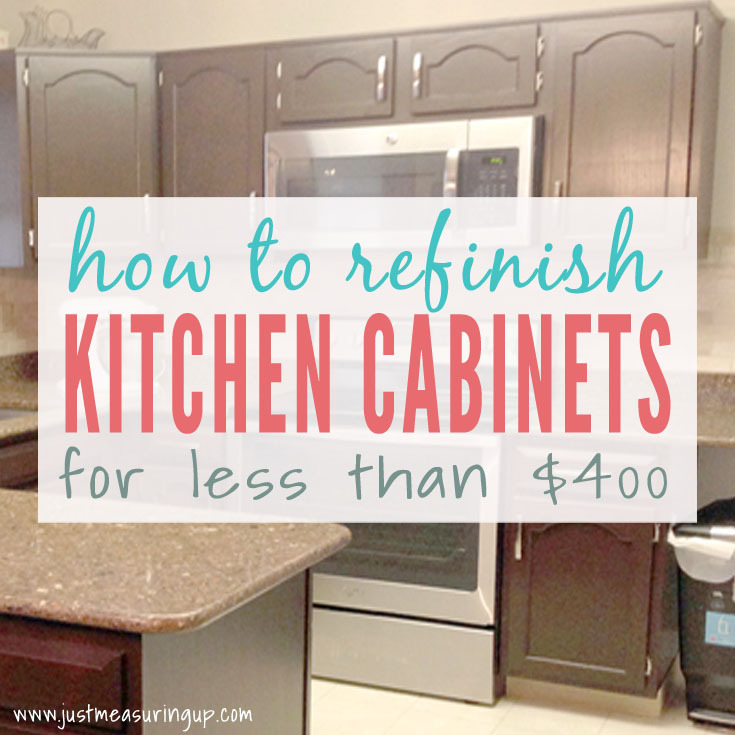 The kitchen cabinet pulls worked out to be around $200, making the total cost just under $400. Now, it was a big time commitment, but if you dislike your kitchen cabinets that much, it’s 100% worth it! 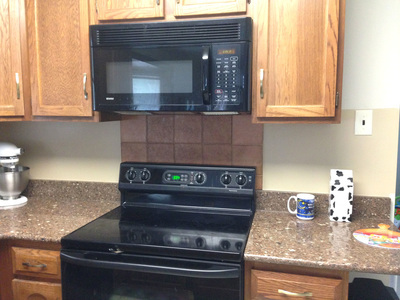 Here is an after picture – with the refaced cabinets, new appliances, and the tile backsplash Ash did right after we put the cabinet doors and drawers back. 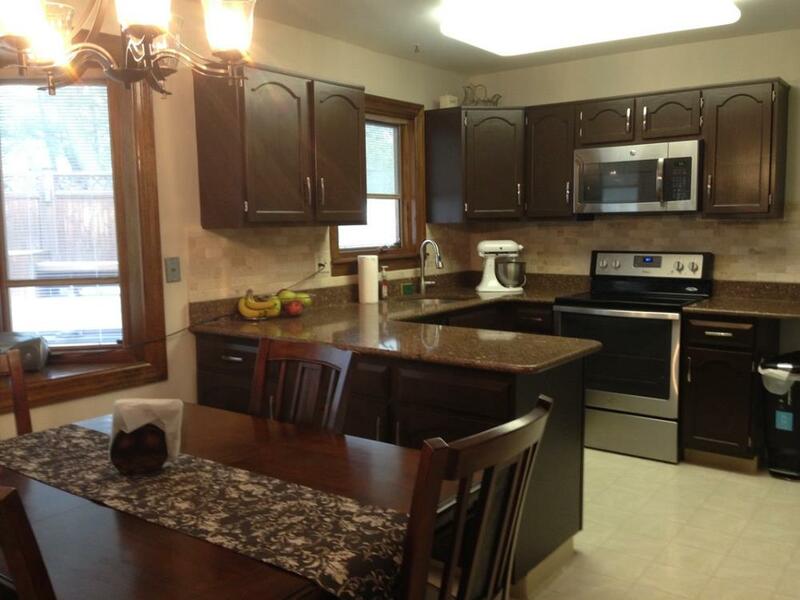 Here is another look at before and after and the difference that gel staining kitchen cabinets made. We also replaced the gold chandelier with this modern one from Overstock. Updated pantry – more space! Look for future posts regarding the rest of the list! Thanks for reading! Thank you so much for reading and for your compliments! This project was a lot of work but we love the results! Wow, looks great! How much stain did you end up using? 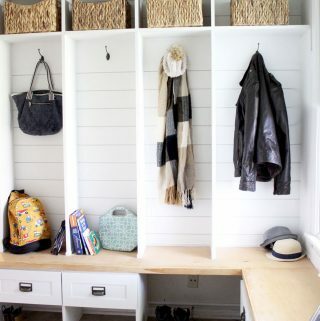 I have a large kitchen with lots of cabinets I am considering doing this to. Not sure if I’m up to the task though! Hi Erika! Thanks for your compliments! Between the kitchen and the small bathroom vanity, we used three quarts of the general finishes gel stain in antique walnut. I did three full coats and touched up in certain places. But four full coats probably would have been better. If you use their darker stain (espresso), I think you could get away with less coats. I love case studies. Looks really great. Before and Afters are my favorite. I own a cabinet and countertop company and I love seeing the end result. Great information. Hi Marci, Thanks so much!! 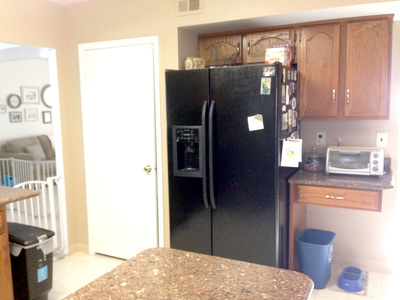 Yes it was all small color changes – and cost very little compared to the cost of redoing kitchens! 🙂 Happy New Year! I really like the dark cabinets. Staining them really made a huge difference. That is just beautiful! 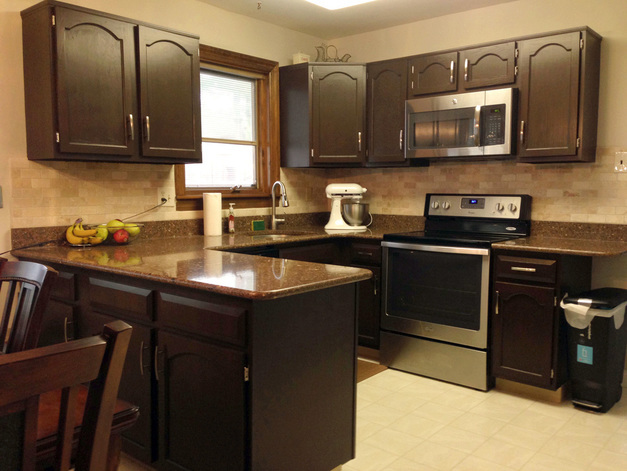 I love the dark brown cabinets; makes it looks like a whole new kitchen. Thanks, Mother of 3! It does 🙂 Happy New Year! Thanks, Sarah!! :)) Happy New Year! What a transformation! The dark cabinets and light paint make a huge difference. I’ve been dreaming of a white kitchen, but this makes me want to give dark stain a try, too. Thanks again for sharing at the #happynowlinkup! Thanks, Leslie!! Yes – we are so happy with it! I love white kitchens too but we were working around the brown granite to keep the cost down. Happy New Year! 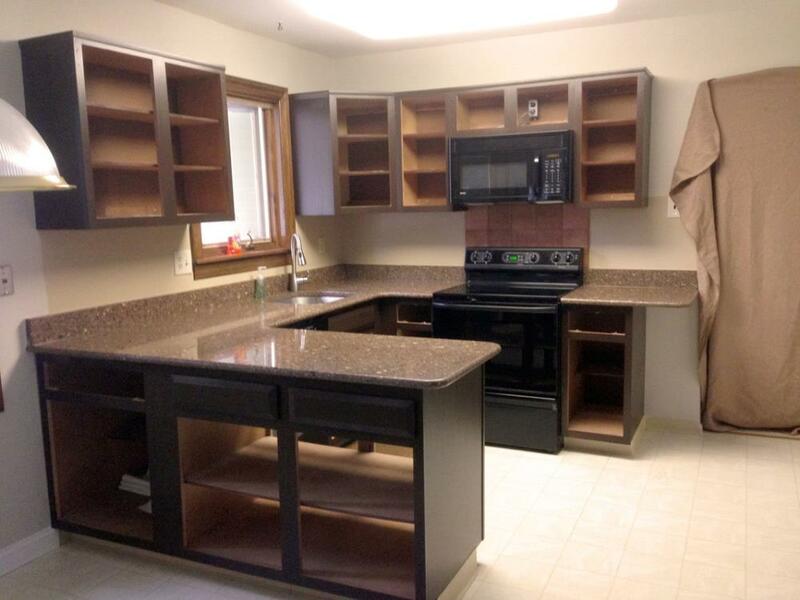 I have the same kitchen layout that came with the same boring cabinets. It was one of the first things I changed when we moved in, went with a mahogony gel stain. I still have my bathroom cabinets to do….not looking forward to that. 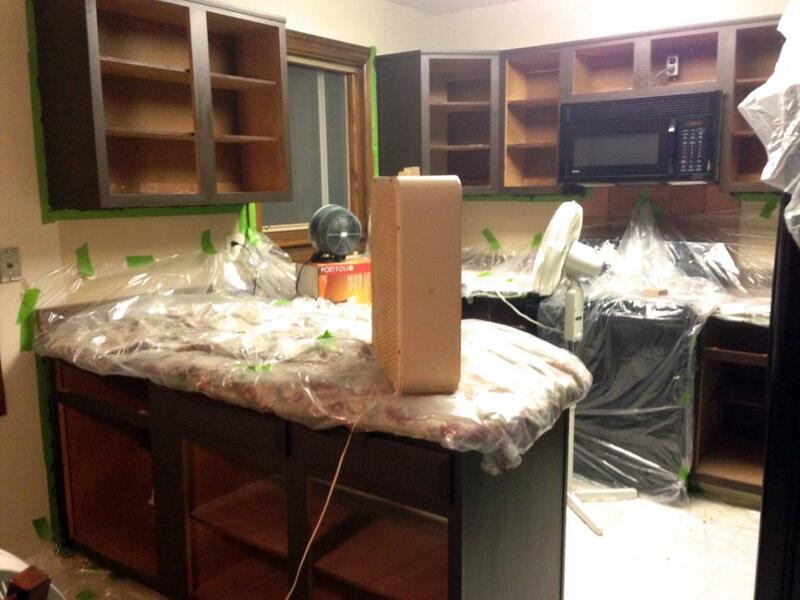 Did you sand your cabinets first? They turned out terrific! Wow! That looks amazing! I am thinking about painting our cabinets white, but a little scared to try. Great job! What a beautiful transformation! That darker color really upscales the whole kitchen. Thanks so much, Rheta!! Happy New Year! Wow! Great job! I wish you two and your blog had been around when we were doing so much to our house, but I’m still fascinated by the subject even if I don’t have a place to apply it right now, so … I’ll be back! Ah – a project I will be doing this year! 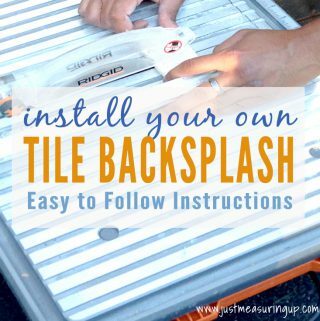 Thanks for sharing yours on the DIY Party! Wonderful job! I didn’t read about the bathroom makeover but I am wondering why Gel Stain is chosen? Does it penetrate or hide better? The new metal handles and appliances really gave your kitchen some great updating too! Turned out just fabulous! Thank you for sharing with us at the To Grandma’s House we go link party last week, you will be featured in the next party that starts tomorrow morning! Hope to see you there! I love the darker cabinets and this is a really great makeover. Thank you for sharing with us this week at Celebrate Your Story, have a great week. Your kitchen cabinet makeover is spectacular. Thank you for sharing at Vintage Charm. Looks very nice – you did a great job. It is amazing how much difference doing small things such as changing colors or patterns can make in a kitchen or any room- without spending a small fortunate. How beautiful! You did an amazing job! Visiting you from the link-up. 🙂 God bless you all. Thanks, Theresa! Good luck!! We still have the lighting and window trim to do 🙂 Hope to get to these this year! Hi. I came across your blog while researching gel stain. So many tutorials use the java stain so I was happy to see a final result using Antique walnut like I am. If you wouldn’t mind helping me though…. I have 2 coats of stain on. I used a foam brush and lightly wiped off excess with paper shop towels. While the stain is even I can still see the oak grain very prominently. I’d rather they look more solid like your cabinets appear to be. What can I do differently? I feel I have to wipe off the excess because the stain does not go on smoothly like paint would.